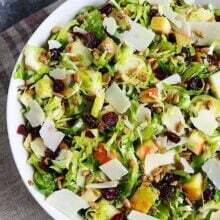 Shaved Brussels Sprouts Salad-thinly shaved brussels sprouts with apple, dried cranberries, sunflower seeds, Parmesan cheese, and a simple maple mustard dressing. 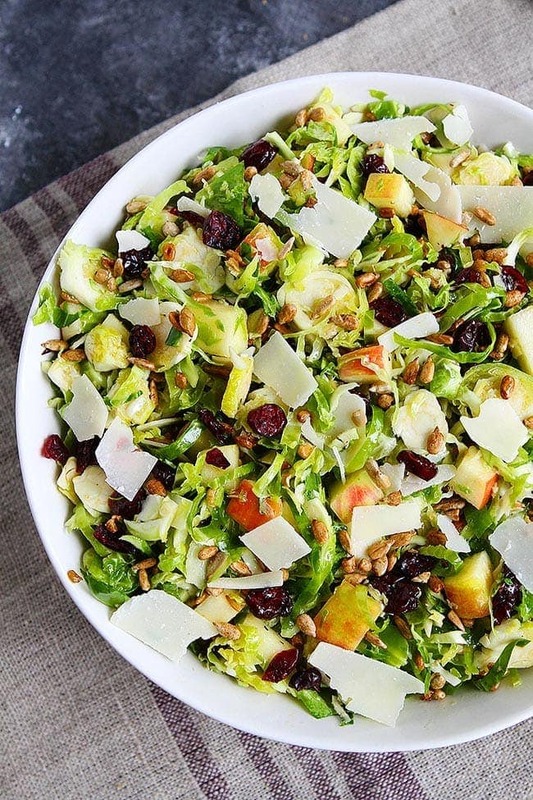 This easy Brussels Sprouts Salad is the perfect side dish for Fall or the Holidays. 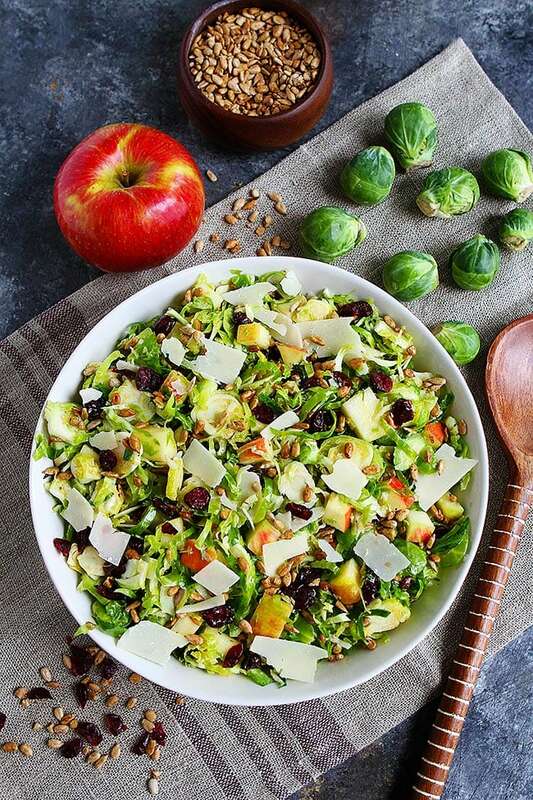 If you are looking for the perfect salad to serve at your Thanksgiving or Christmas dinner, you are in luck because this simple Brussels Sprouts Salad is always a holiday favorite! I make it all fall because I love it so much, I can’t wait for the holidays, but I always make sure it is on our Thanksgiving and Christmas menu. 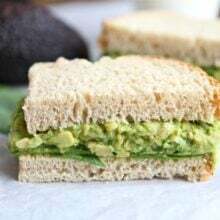 The flavors are incredible, it is pretty to serve, and it holds up well so you can make it in advance. Plus, our friends and family love it! It’s a winning salad! To make a brussels sprouts salad, first you have to shred or shave the brussels sprouts. Don’t worry, it is easy! You can use a food processor, mandoline, or sharp knife, all methods work really well. First, wash the brussels sprouts really well and remove any leaves that are damaged. Trim off the ends with a sharp knife. To shred brussels sprouts in the food processor, use the slicing attachment and pulse the brussels sprouts until they are shredded. To shave the brussels sprouts with a mandoline, make sure you are VERY careful. Use the guard or even better, get a cut resistant glove. Use the thinnest blade on the mandoline to thinly slice the brussels sprouts. To shave the brussels sprouts with a knife, use a sharp knife and slice the brussels sprouts as thin as possible. Can you Eat Raw Brussels Sprouts? YES, and they are so delicious! I know brussels sprouts are traditionally roasted or sautéed, but you have to try them raw in a salad. They will remind you of cabbage. They have a nice crunch and are so good in salads. I love using shaved brussels sprouts in salads because they hold up. You can dress the salad hours before serving and it is still good. The brussels sprouts don’t get soggy at all. 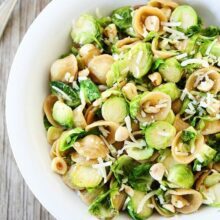 After you have your shaved brussels sprouts, you can add in all of the other ingredients. 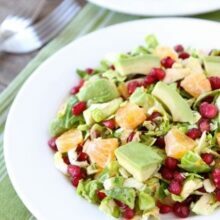 This salad has everything…sweet, salty, crunchy, tangy, and it is pretty to serve! It is the perfect salad for any meal. I like to use Honeycrisp apples for this salad, but feel free to use your favorite. I also like to use sunflower seeds, but chopped pecans or almonds would be good too. Shaved or shredded Parmesan works well in this salad. You can shred the brussels sprouts up to 2 days in advance. Keep them in a Ziploc bag or container in the fridge until ready to assemble the salad. You can also make the dressing up to four days in advance. Keep in the fridge until ready to use. Whisk well before dressing the salad. 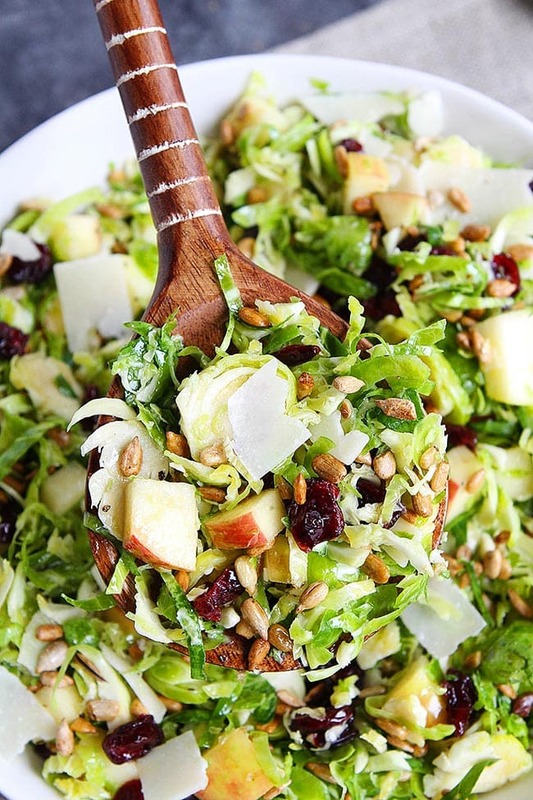 This easy Brussels Sprouts Salad is the perfect side dish for any fall or holiday meal. First, make the maple mustard dressing. In a small bowl or jar, whisk together the olive oil, lemon juice, apple cider vinegar, pure maple syrup, mustard, and garlic. Season with salt and pepper and set aside. Next, shave the brussels sprouts. Use a food processor with the slicing attachment and pulse until the brussels sprouts are thinly sliced. You can also use a mandoline or sharp knife if you don't have a food processor. Place the shredded brussels sprouts in a large bowl. Add the chopped apple, dried cranberries, sunflower seeds, and Parmesan cheese. Drizzle the salad with the dressing and toss well. Season with salt and pepper and serve. 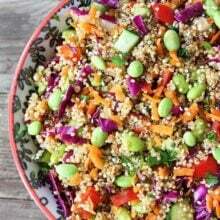 Another healthy salad recipe. I love brussels sprouts. Thanks for sharing! YUM! Give me all of the Brussels! For lovers of Brussels sprouts, this is an amazing recipe. What an interesting twist to it, and its great that it only takes a 15 minutes to prepare. True, this meal is perfect for a holiday side dish. A great recipe, would like to see more. Made this twice now for family gatherings and it’s so delicious! Can’t believe I didn’t know it was so easy to shave my own Brussel sprouts! Will be adding them to lots of salads now. Glad you loved the salad! More new choice for weekend meal. I’ll make it for family. Great photos, thanks for sharing. I really thought you were an expert in brussels, I was wandering for a recipe on it, and I stumbled across your blog by chance. Thanks for sharing. Yummy, love sprouts. I added the recipe to my list. Love how you shared the recipe also with some tips. Thanks for posting. My God, looks so good. I always prefer salad on my meal, added this on the my list, will make it sometimes. Thanks for nice post. We loved it! I added sliced green onion and substituted blue cheese for parmesan cheese but besides that, we loved everything about this salad–yum!